The vehicle is equipped with a Supplemental Restraint System (SRS) which includes components such as airbags. Before servicing (including removal or installation of parts), be sure to read the precautionary notice for the Supplemental Restraint System (See page ). (a) Check if the illumination for the navigation receiver assembly, steering pad switch, heater control switch or others (hazard switch, transmission control switch, etc.) comes on when the light control switch is turned to the TAIL or HEAD position. 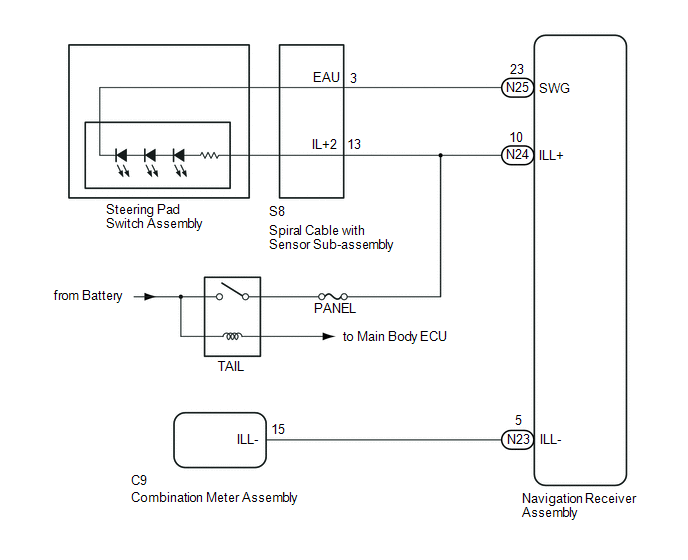 (a) Disconnect the spiral cable with sensor sub-assembly connector. (b) Inspect the steering pad switch assembly (See page ). (b) Inspect the spiral cable with sensor sub-assembly (See page ). 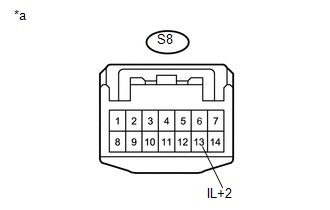 (a) Disconnect the S8 spiral cable with sensor sub-assembly connector. (b) Disconnect the N25 navigation receiver assembly connector. 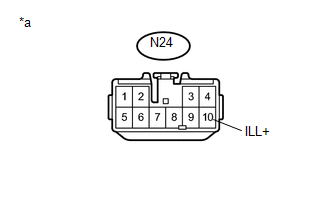 (a) Disconnect the N23 navigation receiver assembly connector.